I just got back a few days ago from 9 days in England, on the Isle of Wight where my in-laws live. Before making the epically long and expensive journey to the IOW, I wanted to make a quick stop into London-to Camden where my favorite store, Braintree Hemp is located as well as InSpiral lounge which I had wanted to visit for a long time now. After stocking up on some lovely hemp clothing, including two dresses, a skirt, a fabulous pair of black trousers and a purple backpack, we hit up InSpiral. I was first a little shocked at the inside as it wasn’t what I was expecting. I suppose I expected something a little more formal with table service, but everything is pre-made behind a case. You line up to order and pay and then find a table. It was really crowded when we first went in, but we lucked out and got a table almost immediately although it took a little more maneuvering to figure out where the line was to order. I found the staff to be knowledgeable but slightly unfriendly, except for one woman who was super friendly and chatty. I have the feeling she may have been a manager! However, the most important part is the food! We truly weren’t that hungry but I was determined to try out some dishes!! I ordered the raw nachos, and with every meal you get three sides so I chose three raw salads. One was the Raw Caesar, then there was a massaged kale dish and another beetroot and apple superfood salad. I was super impressed with this dish! 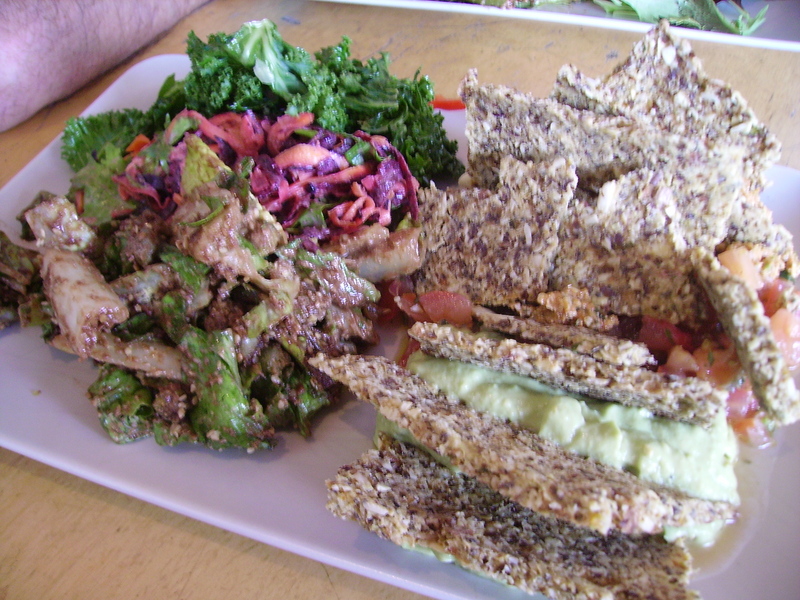 The crackers or nacho chips were really crisp which is important in raw food dishes. The part that blew me away was the nut meat. I have experimented in the past with raw taco meat, and this version was INCREDIBLE and super spicy! I could tell that it was made with sunflower seeds which is surprising because I haven’t had too much luck with sunflower meats in the past. My hubby went for the Love Burger with the same sides as me. I thought his burger was good, but truly nothing can compare to the raw burgers we got in Amsterdam at a market stall! The salads were really good. The kale salad was my favorite- it was simple, fresh and delicious but the other two salads really shined in the creative front. I appreciated InSpiral’s liberal use of superfoods in the dishes as I think that those ingredients can really take a dish to the next level, and they were very inventive in this way. The Caesar salad for example had cacao nibs, and the beetroot and apple salad had maca, as well as many other things that I can’t remember now! I also picked up two containers of Cheesy purple corn kale chips which were so so very delicious that I should have picked up 10 more, a bag of Loveberry granola which was meh but made me feel waay better about my own underwhelming experiences making raw granola, and a piece of raw key lime pie, which I had for breakfast the next day and was just amazing and tart and sweet and creamy and everything that key lime should be. So there! All in all, I was very impressed with InSpiral Lounge and wish that were closer or that I lived nearer. 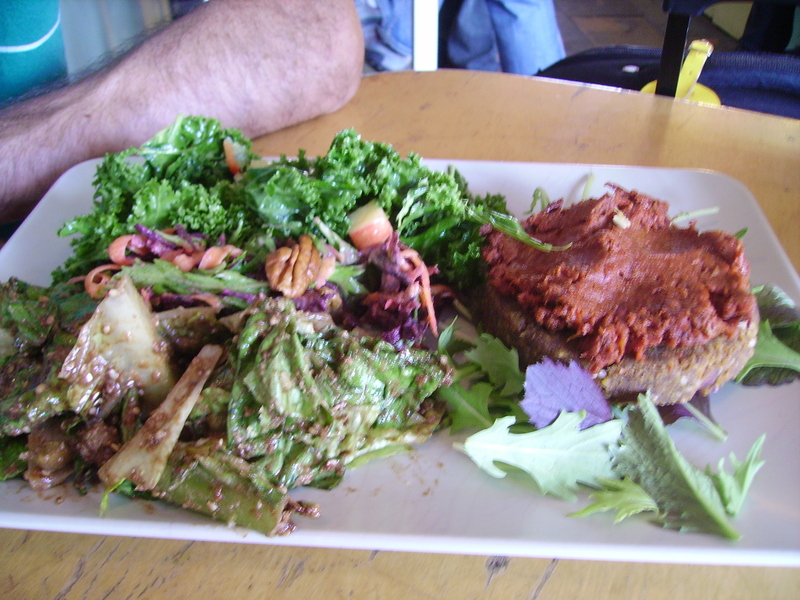 The food was tasty, cheap, filling and interesting, all vegan, and what we ordered was all raw. You really can’t do much better than that!